The Sony Xperia sola, previously referred to as the Xperia Pepper, got unveiled yesterday and much of the fuss about it was the new “floating touch” screen. The technology makes it possible for your smartphone to detect when you hover your finger up to 0.79 inches (20mm) above it, so you can control certain things without even touching the display. But how does Sony make the magic work? Erik Hellman, research engineer at Sony Mobile and one of the inventors of the technology, explains in a detailed blog post and here’s what it boils down to. “Floating touch” is a technology that is innovative by combining already existing capacitive touchscreen implementations. As you probably know, you need conductivity in order for your capacitive screen to work. But there are two types of display which differ in the strength of the signal they receive. First, there are self capacitance displays with strong signal. They can detect your finger from 0.79 inches, but have a limitation - they don’t support multitouch. Second, there are multi capacitive screens which work with multitouch but in order to narrow down the exact position of each finger they reduce the signal strength, so they can’t register a hovering finger. Self capacitance "ghosting" (the red crosses) occurs when you place two fingers on the screen. The phone can't determine the exact position of the fingers and instead detects four instead of two contact points. 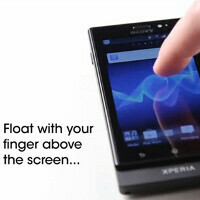 This is where Sony innovates by bringing the two together in its “floating touch” display on the Sony Xperia sola. “By leveraging on the existing capacitive touch sensor, and lowering the threshold for touch registration, it will be possible to differentiate between floating touch and “normal” touch,” Sony explains. To make use of the technology, though, the apps will need to support it. So far, Sony is supporting floating touch in the browser and the live wallpapers, and that’s about it. The company promises to open up APIs for developers with the upgrade to ICS for the Xperia sola, and this means very soon programmers could bring this to apps near you. Check out the video below for a demonstration of how the technology works and let us know - is that the new input method we’ve all secretly wanted? why would I want my fingers to be hanged mm away from the screen!! i will touch it, easier and more comfortable! Why don't you watch the video? It's just how a mouse works. You hover over the screen and it highlights what you're over so then you can click what you want and not something by mistake. That will make precise clicking a hundred times easier. I think it's an awesome feature. Just figure out how to incorporate multitouch and it would be perfect. They need to combine these into a single superphone. its useful for guys who have big fingers.. some people are just plain whatever.. I think this has some promise as long as they don't use it for any major controls, it'd be fine for hovering over links. Also, my Nexus S detect my finger when I hover 1 or half mm above the screen. great idea, i always hit the wrong part on my touch screen b\c i have big fingers this would help out alot. Now this is cool! I just hope they put this on the SONY iON or other SONY models. I had this phone for over 2 years!